In 2015, Wayfair.com launched its Trade Tastemaker awards to celebrate the work of interior designers and decorators across the country. Thousands of design professionals entered to win across six different categories. Celebrity judges help choose the winners, and a celebration is had to present the awards in person. See the winners here! I was lead and solo designer on this project, working closely with the project manager from Wayfair’s Trade Services department (no known as Wayfair Professional). This initiative was the first of its kind at Wayfair, and is still going today. See the winners from 2018 here. Not only did I design the digital marketing materials for the event, but the print materials as well to include a printed invitation, a book of the winners, a step & repeat banner, and the actual award given to each winner. As the first of its kind, branding the awards as a whole was necessary. The direction was to create a clean, upscale design that would pair well with the Trade Services logo and work with various backgrounds, marketing materials, and space. Below are the final designs. I designed and coded all of the marketing and content emails for the event. Emails were sent leading up to the event, during and after. The email list was pulled from members of Trade Services who specifically identified as interior designers. Here are a few samples below. The Wayfair e-newsletter featured the awards, allowing each winner their own spread as well as a page for honorable mentions. 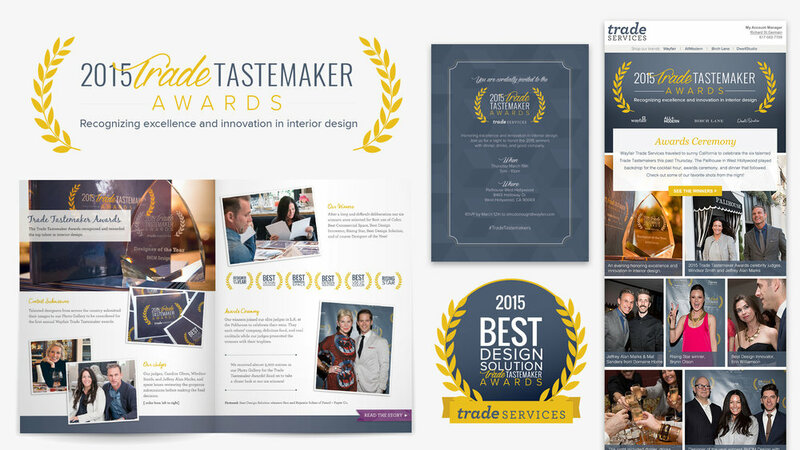 I designed the layout with elements from the Tastemaker Award branding, photos from the event, and photos of each winners’ work. Scroll through to see each layout below.